A wet spring and warm summer, with plenty of sunshine, advanced the maturity of berry and summer fruits, bringing the harvest forward. As crops ripened well in advance of what would normally be expected, there was plenty of fruit available in domestic markets over Christmas and the holiday season. Later maturing crops, such as grapes and apples, were also well ahead of schedule so during mid and late summer, harvest periods were running a fortnight to a month ahead of normal seasonal conditions, depending on location. Crop quality was challenged due to the dramatic change to the weather patterns in January and February. Pest and disease management has consequently been a greater issue than growers would like. Growing conditions, however, have been favourable for all crops, including covered crops such as tomatoes, vegetables and flowers. into mid-February. This year, the later varieties were ripe almost in line with the earlier ones so, by the time the Chinese New Year market occurred in mid-February, the product had already been and gone. Early harvests also left fruit competing with produce from South America and Australia. Approaching grape harvest, netting has gone on the vines and a fair season seems to be in prospect for viticulture, subject to local weather conditions remaining good through March and April. Tasman received rainfall during January three times the average levels. 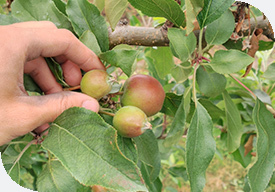 Continuing good growing conditions through autumn bode well for the pipfruit harvest, though growers need warm fine days and cool nights to bring the colour out of their apple varieties, and too much humidity could pose a challenge with that. Prices are holding up in export markets and demand for New Zealand produce remains steady to firm. Those producing avocados, kiwifruit and apples should continue to enjoy positive returns. Expecting to remain well-rewarded for their efforts, growers are responding accordingly, with development in horticulture continuing and conditions for investment set to remain favourable. Significant investment is occurring in kiwifruit, apples, cherries and avocados. Much of this is phased, with land preparation taking place initially, followed by greater investment when planting is required. For kiwifruit in particular, with Zespri signalling additional G3 licences, growers will be presented with considerable opportunity, but a dilemma on where to plant this crop. Those orchardists who seek to capitalise will either have to pull out existing crops, cut over and graft onto less highly rewarding varieties, or buy and develop bare land.